I’m going to have a bah humbug moment, so forgive me. Christmas lights and decorations have been up for many weeks and there are times it feels like Christmas runs from the first day after Halloween. Yet, not only are we nowhere near the Christmas season, we have Advent to get through first. Starting today with Advent Sunday. So, bah humbug. Now, there’s nothing wrong with enjoying Christmas, the problem comes that the ideas behind Advent get lost in all the glitz. And that can be true in Church too, we start singing Christmas carols, have all that lovely glowing stuff about Bethlehem, and generally feel a growing surge of warmth, along with the rising panic about getting ready for the day itself. But we miss out on the metaphorical journey that leads us to Bethlehem. In the past Advent often involved serious fasting, in some cases three days a week in the weeks leading up to Christmas day, and sometimes monks were expected to fast every day. In the Eastern Orthodox church, it’s been called the Nativity Fast. That’s a far cry from what most people in this country will be doing over the next few weeks. The Latin word adventus is the same as the Greek word, parousia, and is about ‘coming’. Traditionally there are three aspects to be remembered, the first coming, so, Jesus and the nativity stories; the second is a daily coming of Jesus into our lives, and the then there’s the final coming, the eschaton, the second coming, when Jesus returns on lots and lots of clouds, and probably with lots and lots of angels too, only they’re going to be warlike, not Nativity cuties. So, Advent is meant to be about serious stuff. So, that ‘second coming’ which the reading from the Gospel of Luke presents to us as a very serious matter. In its context: Jesus is in front of the temple, a magnificent religious building, the physical sacred centre of Judaism. And one of his followers’ comments on that magnificence. And Jesus does a ‘bah humbug’ moment, saying that these stones will not last, they will be torn down. He then goes on to speak about extraordinary dramatic events, which lead up to our Gospel passage. To paraphrase him, the world will undergo dreadful times, fearful times, it will be a scary place to be living in. So, watch and wait, be aware. Because the Son of Man will come on those clouds. I’d like you to imagine three ‘horizons’ for this passage. There’s the world of Jesus around about 30 in the CE, and then there’s the world of the writer of the Gospel, possibly around in the 80 CE, and then there’s our horizon, how we see this. We get a sense of Jesus and the writer’s horizons in these words. Jesus’ world had the powerful elite of the Jerusalem Temple, and the extreme power of the Roman Empire, with its soldiers and garrisons, taxes, and brutality. So, with Jesus speaking these words in front of the Temple itself, he is touching on the threatening way that world is drawing tightly around him. The threat from the Temple authorities is increasing, they are after his life, and behind that is the potential lethal threat of the Empire. By the time of the writer of the Gospel, the Jerusalem Temple has been destroyed by the Roman Empire, Christians have been persecuted, and at times brutally and gruesomely killed. They are a group who are increasingly under pressure from sections of Roman society, and there’s a real sense of terror. This passage fits both those horizons. And then we have our ‘horizon’. The world we live in, with its disturbing headlines, and the fear of being played on by experts or politicians. Trust has been eroded in our world, in its institutions, even in the church. It can all feel very bewildering. So, Jesus’ words might touch the disciples, the early Christians, and ourselves. Intriguingly all this second coming talk is likely to have left the first century Christians filled with hope and excitement, after all their lives were at risk from being Christians. In the mid-first century, Nero is said to have used Christians as candles, and there were many other brutalities that would leave those early believers uncertain about their future. So, to hear that there was a hopeful future, a change from the dominance and brutality of the Roman Empire, would be a good thing. They would have heard these words as suggesting radical change, of hope. But now, with centuries of Christendom behind us, being a Christian for most of us in the west may be an embarrassment, or an awkwardness with some friends or work colleagues, but we are comfortably off by comparison to many of the early Church. In some ways we are the religious elite, the holy ones, the equivalent of the scribes and the pharisees. So, where’s our anticipation of wanting our world to radically change? Do we really want everything to turn upside down? Do we want our lives to turn upside down? In the passage, Jesus exhorts us to stand up and raise up our heads, do we want to do that? Do we really want a disturbing Advent, full of this type of distressing Jesus-talk, or of fasting, would it be much better to go with the rest of the world straight to Christmas? To get on with having fun, eating, Christmas lights and laughter? Jesus urges us to live differently, to lift up our heads, to be different. He wants to motivate us to be watching and waiting. But does he still do that? Our faith can make us socially respectable, we’d like to be seen as part of the moral and social fabric of our communities. We can enjoy Christmas and ignore Advent. We can ignore the poor, the persecuted, the refugee, the discriminated, the left behind. 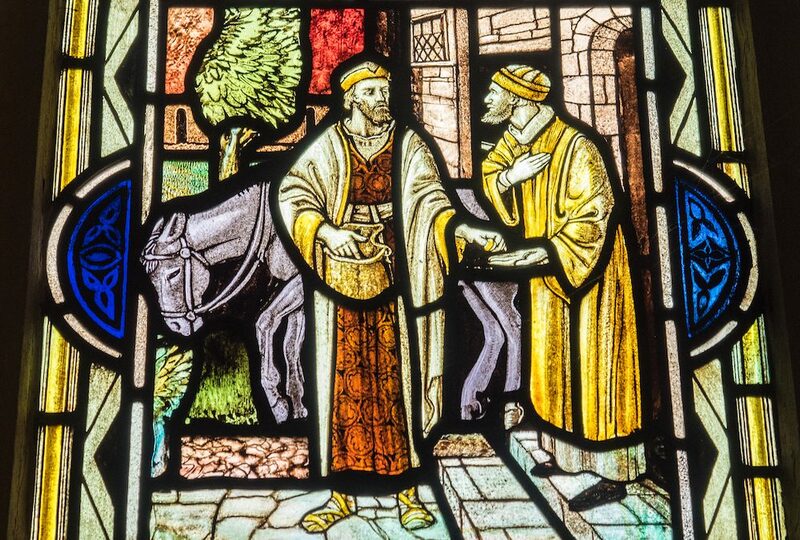 Part of the wider message of the gospel of Luke, like in the parable of the Good Samaritan, is that the doctor of the Law cannot suddenly become a Samaritan. He is who he is. The only alternative left to him is to act like the good Samaritan. Similarly, the Pharisees who’ve been challenge Jesus, cannot leave behind their faith, their piety, and their obedience to the law. The only alternative is to join the ‘sinners’ in their pain and their trust in God. Because Jesus constantly seems to be saying that this is who the Kingdom of God is for, the marginalized, the discriminated against, the poor. We can’t easily change our circumstances, but we can change how we relate to the poor in our communities, and in the wider world. Part of the message of Advent is that there is a hope, there is a time when the tragic, terrible things will be no more. But, in the meantime, we are called to stand up straight, to lift our heads to that future and to notice what is happening in our present. This should shape and inform the way we live today, the way I live today. What would it mean to live Advent in this way? Head up, aware, watching and waiting, seeing the world through Advent eyes? The church, this benefice, you, so much is being doing already. Yet we are called to be watch and wait. One example. On Friday I heard Mary Robinson, the United Nations special envoy on the Climate speak. She was arguing for Climate Justice, not just about climate change, and speaking of the hope she finds in that. Climate change is a potential cataclysm for many, and Climate Justice is a demand to speak out on the part of all those, in the southern hemisphere, those who lives on small islands, those in impoverished parts of the world, and the many others who already suffer from climate change. Could we live out Advent as Climate Justice? And with the city of Bristol aiming to be carbon-neutral by 2030, what does that mean for us? Or maybe to spend time reading an Advent book, like Richard Rohr’s or this one by Janet Morley using poems each day. Or there are various Church of England Apps which offer prayers and lectionary readings. To help us watch and wait. That’s what this Advent Sunday offers: God’s future as God’s call to our present, and the present as the time of decision in the light of that future.